Consider the cicada. When compared to bees, flys, and beetles, this is hardly a conspicuous member of our community. It is here, but I have only seen one twice in the last five or so years. I first saw one two years ago. It turned out to be the amazingly rare, Platypedia putnami, last reported in British Columbia (indeed, anywhere in Canada) in 1942. Pictures of P. putnami appear on my page about true bugs. What about this most recent cicada? Andy Hamilton, an expert in such matters, tells me that it is one of the whip cicadas, genus “Okanagana, and probably O. vanduzeei (which is also rare).” It is unclear why both of my cicadas would turn out to be rare. Alas, small-number statistics aren’t a good basis for generalizations. The cicada would be a strong contender in a contest to pick our ugliest bug. Not that it is vicious—it neither bites nor stings—just that…, well, the picture says it all. Alistair, I am amazed at the quality of your closeups – what camera / lens do you use to get such detailed photos? Jana, I use a dedicated fixed-focus macro lens. The reasoning is that a lens designed to do only one thing well (in this case take macro images) will almost invariably do it far better than will a compromise design for a lens trying to do many things. To this I add a ring flash to enable me to get a uniform strong lighting so I can stop down and somewhat overcome the shallow depth of field of most macro photography. Thank you for sharing, Alistair. What is your macro lens – 100mm? I am learning so much from you by following your blog. Your knowledge, explorations and photography make me to want to do more of my own and become better. Thank you for this wonderful blog. Jana, the focal length of my macro lens is 105mm, which works well for flowers—they don’t mind an approaching photographer. Arthropods tend to hide when asked to pose for a closeup. So I often use a (rather good) 2X extender on the macro lens when shooting bugs. Of course, this decreases the maximum aperture by two stops, but as I use a flash and want to stop down anyway, this isn’t a problem. About the blog: it is good fun for me. Thanks for all this! Please keep on blogging. Similarly to Gail (comment below), I heard what I thought, but not really believed, to be a cicada just at the time of you posting the info. Quite interesting – I would love to see one here in the Kootenays. Wondering if they all come out at the same (sort of) time.. This is so cool…my husband was looking these up on the internet a few days ago. Said he was hearing them when it was really hot here. Can hardly wait to show him the picture. I do not think they are in Alberta. They can be heard in Ontario when it is hot out. Will have to see if I can find one to shoot. Love the detail in your shot. Alistair, another spectacular find. I was thrilled last week to hear what I believe is a cicada here in the Bulkley Valley. They have quite an unmistakable buzzing “call”, that I know of no other insect with a remotely similar sound. I was unable to find the producer of the sound to confirm or refute my speculation. 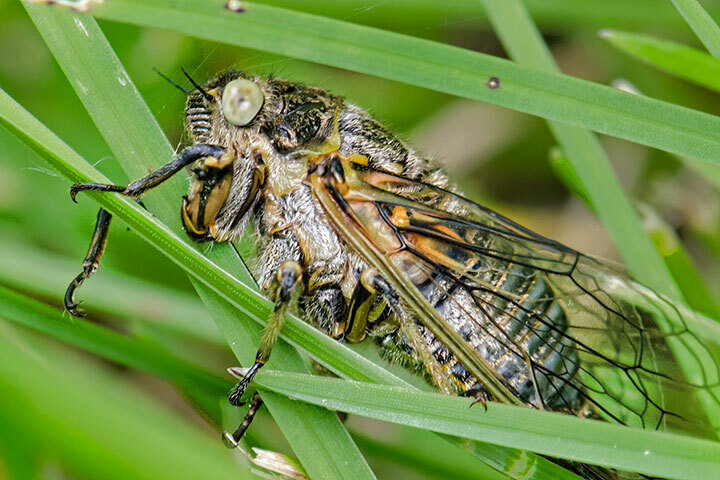 I hope to experience the emergence of the 17-year cicadas in the eastern US, sign, only 10 more years to wait (but lots of time to plan a trip).